Author of Guide to Lace and Linens, Anybody Can Mend Lace and Linens, as well as other study guides to old lace. How to order: Pre-order from ekurella@gmail.com Eventually the work will be available through the usual lace book sources. List Price, shipping costs: Book cost $30, priority shipping $5.60 in the USA. Format: 150 pages, dozens of large black and white photos, and dozens of patterns for lacemakers. 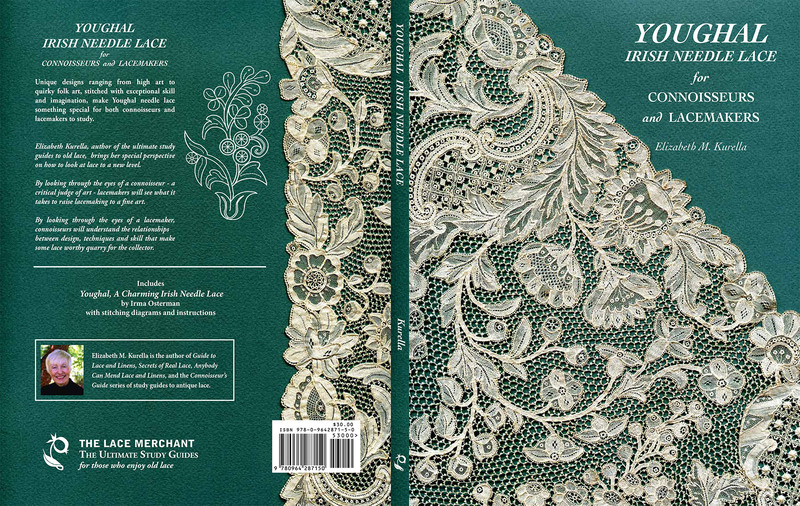 On Friday, April 25, 6:30 PM Elizabeth Kurella’s new book — Youghal Irish Needle Lace for Connoisseur’s and Lacemakers – will be released! Come celebrate with the author and with staff from The Lace Museum. See real Youghal Irish Needle Lace up close! Hear about the process of producing a book about lace. The 150 page book includes a history of Youghal lace, wonderful photographs of fine lace, and dozens and dozens of patterns for making the lace. It is sure to be enjoyed by lace makers and lace lovers. Also that evening, Elizabeth will be doing a “road-show” style talk and an evaluation of your treasured lace. Bring your family lace heirlooms to the event and Elizabeth will chat with you about their history and value. The event is a fund raiser for The Lace Museum and a celebration of 20 years in our current location. A donation of $25 or more gets you in the door for this fabulous event. You may reserve you place in advance, or just pay at the door. Call ahead to reserve your copy of the book – $30 plus tax. Elizabeth Kurella is the author of many books about lace and is the editor of the fabulous website: www.LaceCurator.info with information for collectors and lace makers. Elizabeth has studied the history, identification and evaluation of lace in the lace centers of Europe. She has written for Antique Week Magazine and lectured at important lace events around the world. She has curated shows, taught lace identification and care workshops for national groups and appraised lace collections for major museums. She published The Lace Collector from 1991 – 1994 and currently oversees the Lace Curator website. She has published 9 books all related to lace. Did you ever come accross the name Lavery when you were researching Youghal lace. The Laverys regionally came from Silverwood Lurgan CO. Armagh. My apologies, I haven’t checked my comments for a while. No, I have not encountered that name. Were they lacemakers?